The Bushmans Blue Station has been specifically designed and manufactured to store and dispense AdBlue® and stores 1,500 to 30,000 litres of AdBlue®. AdBlue® is a urea-based product that is significantly heavier than water and can also be very corrosive to steel. AdBlue® is added to the exhaust systems of diesel engines to convert harmful NOx (nitrogen oxide) into harmless nitrogen and steam, in turn, reducing the NOx emissions for these engines which a major source of pollution especially in major cities. In 2005, European countries legislated that there had to be a major reduction in the emission of NOx into the atmosphere. The manufacturers of vehicles, in particular, those who made large transport vehicles had to redesign the exhaust systems to meet these new regulations. As a result, more new diesel cars, tractors and other non-road vehicles now have a Selective Catalytic Reduction (SCR) system in the exhaust to reduce NOx emissions. With this, AdBlue® storage became integral to this effort. AdBlue® is transported and stored at refueling locations for use by trucks and other diesel-powered vehicles. 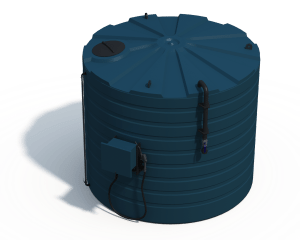 The AdBlue® storage tanks are used to hold and dispense this product on site. The Bushmans Blue Station is stronger than a traditional water tank to allow for high-quality and safe AdBlue® storage. The Blue Station is also an AdBlue® tank for trucks. Bushmans AdBlue® storage tanks are installed in an array of locations including AdBlue® production facilities, service stations, mine sites, transport yards, heavy duty equipment yards and on farms. The Bushmans Blue Station are made ready to go and come with a 30 litre per minute dispensing system already attached to the tank for easy installation. Our AdBlue® storage tanks are one-piece rotationally moulded polyethylene tank that ensures strength in manufacture and no risk of leaks. A screw top vented lid provides safe venting of any vapours and prevents any pressure or vacuum within the tank whilst still being simple and easy to open. The tank features a 50mm fixed inlet pipe, stainless steel valve, male camlock and a dust cover. An inlet pipe is side mounted for easy and safe tanker filling. The AdBlue® storage tanks also feature a suction line that is situated inside the tank permitting the 25mm stainless isolation valve to be conveniently positioned beside the pump cabinet, removing trip hazards. An external sight glass tube is provided for simple and easy management of AdBlue® levels – or ask us about the ultrasonic level indicator which includes a remote receiver with a range of up to 200 metres. The European dispensing system includes a 240V pump and flow meter mounted within a lockable cabinet. The cabinet is mounted to the tank minimising the requirements for valuable yard space as well as reducing installation time. The dispensing system includes an automatic shut off nozzle to prevent spills which can be padlocked in the nozzle holder for added security. Both open top and enclosed bunding options are available. Our AdBlue® dispensing tanks include a comprehensive 5-year industrial guarantee you can rely upon for the tank and pipework, while the dispensing equipment is covered by a 1-year warranty. Call one of our consultants or contact us online to find out more about the Bushmans Blue Station today.